Here we are, deep in the midst of the warmth and relaxing days of summertime again. It was during these very warm summer days, in Jackson, WY that my love of the aspen was deeply and richly nourished many years ago. It was the summertime when her foliage was yet to turn into its shimmering golden hues....yet, still she fully captured my heart and inspired both Woodland Queens and Voice of Wisdom vessels. It's no small joy to be surrounded and reminded of her rich and timeless gifts - deep, deep inspiration and wisdom for each of us in every season. 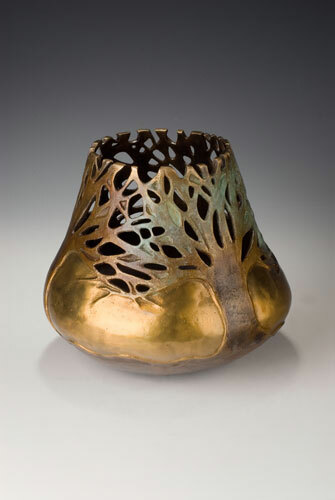 To wear our apparent wounds proudly, as she wears hers allowing her to "be marked as aspen"
Mighty Oak eaned the Groover Studio Award in the recent 5x5x5 National Juried Exhibition at Jacksonville State University, Jacksonville, Alabama. 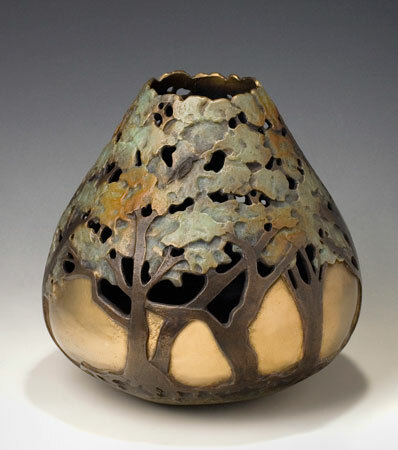 More than 70 artists participated in this juried exhibit with eight awards designated; including the Groover Studio Award. Curator, teacher and writer, Adrienne Callander, Assistant Professor of Arts Entrepreneurship in New College at the University of Alabama, served as the juror for the exhibit. The exhibit was shown at the Hammond Hall Gallery and closed June 24, 2016. Mighty Oak celebrates the many gifts we appreciate today from the diverse seeds sown by generations before us. It also invites us to give worthy attention to the vast potential of ALL the seeds each of us sow within our lives, regardless of how limited we might see them ourselves. ALL our seeds are indeed potent and great blessings to our world when recognized and honored. 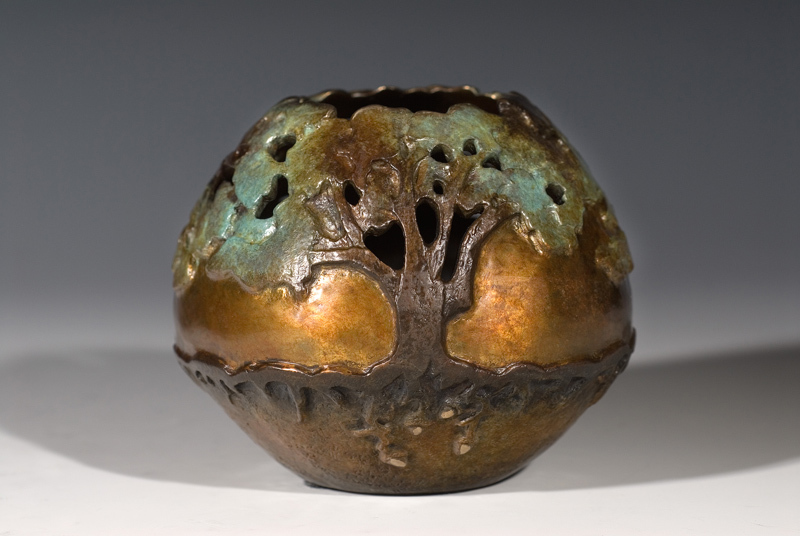 The root system of the three trees on this piece hold twelve ( a tribal, elder number) tiny acorns. This edition is near to closing with only five remaining vessels available in the edition of 120 (symbolic again of the tribal. elder number 12). 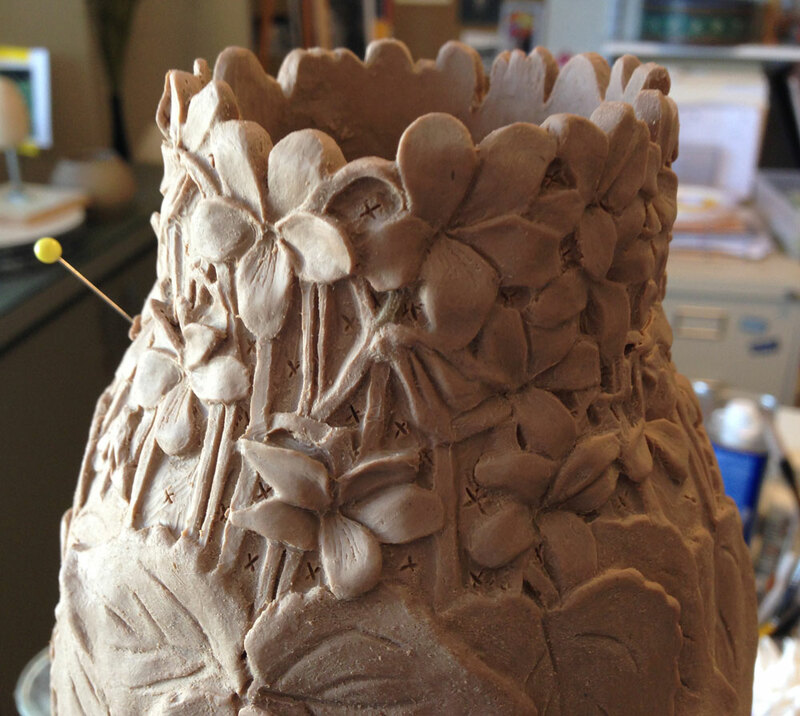 Carol Alleman, Love Blooms, original clay showing the tiny "X's" which is the map for the wax dressing process during the lost wax casting process. The wax dresser remove and clean all areas with an "X" creating the ultimate openings in the vessel. The yellow pin is simply an indicator for me while sculpting to mark a place requiring my attentions - the above photo is not one of the ultimately finished piece but its at about 85% completion. 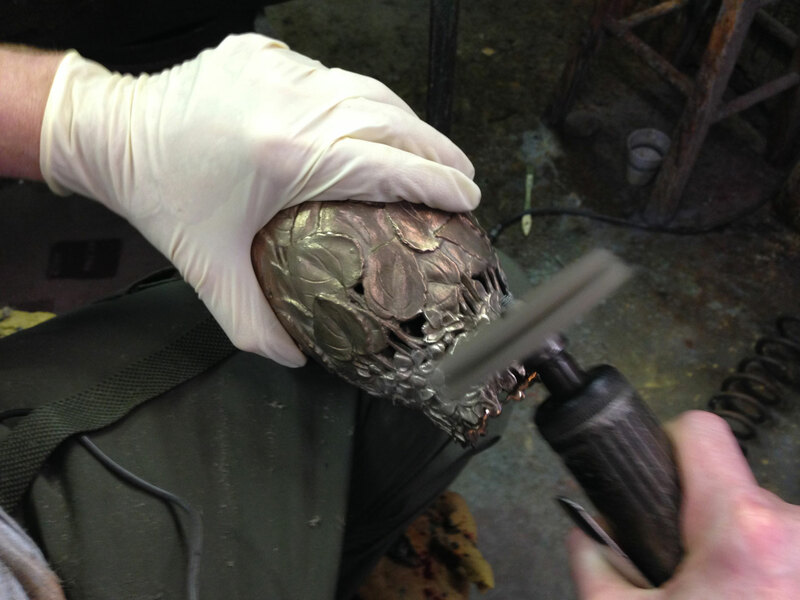 CCarol Alleman, Love Blooms, metal preparation for the patina process to begin. 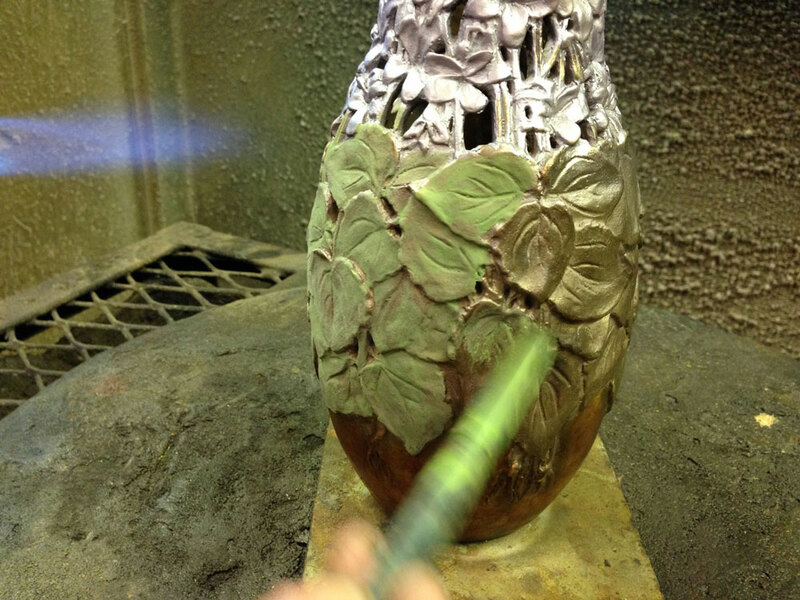 Carol Alleman, Love Blooms, during patina process. 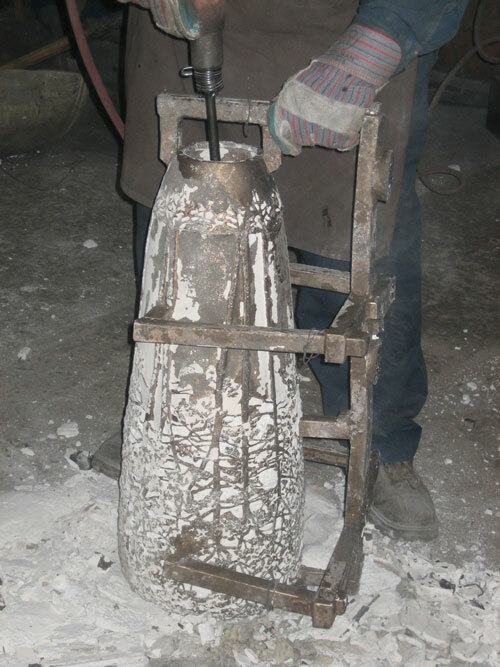 Note torch flame to the left used to control the heat of the piece while dyes, chemicals and pigments are slowly and carefully applied using a brush. 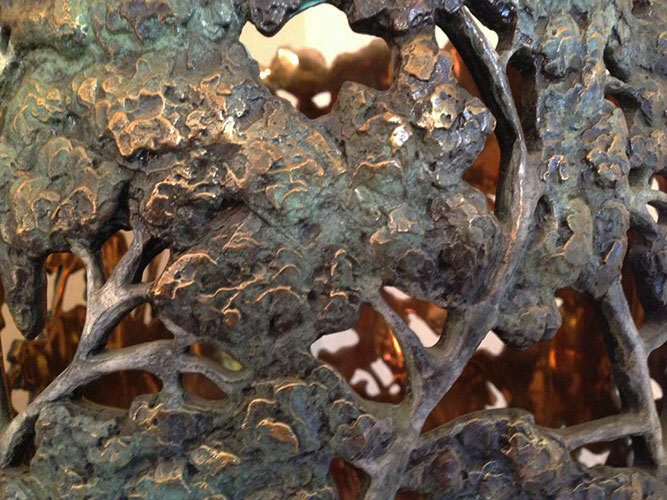 The blooms and stems above the foliage, at this point, are still bare bronze. Artists for Conservation is a Canadian-based international non-profit. Their mission is to support wildlife and habitat conservation and environmental education through art that celebrates nature. AFC represents 500 artists from 27 countries,in the nature/wildlife art genre, who are committed to conservation. Many of the world's most recognized names in the field are actively involved. The limited editions of both Raven and Seasons will each soon close. Raven has two remaining vessels in the edition and Seasons has only one. Raven inspires a willingness to sit with rather than run away from all that might frighten us, as it invites the transformational powers of the raven to transform what we fear as darkness into Light. Three ravens nest high in the branches of the seven trees - symbolic in the limited edition size of 37. Seasons, in its beautiful simplicity, celebrates the vast seasons of our lives with three trees with subtly changing patina effects on each. Just as the color of the seasons in nature changes, so do ours from one season to the next - each in utter harmony with the others. Seasons is currently offered at an exceptional price at $1300. 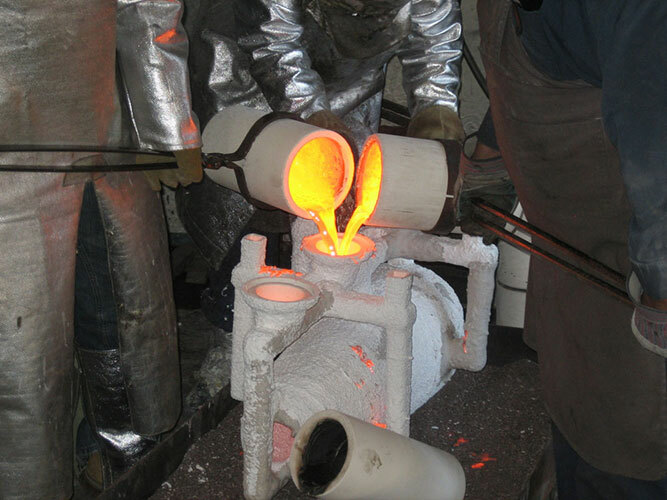 Carol Alleman, Voice of Wisdom, being poured with molten bronze. Carol Alleman, Voice of Wisdom. Close up view of one of the many gates where it was cut from the cast vessel. This area and all areas where the gates were attached must be refined, in metal, to match the original sculpture. 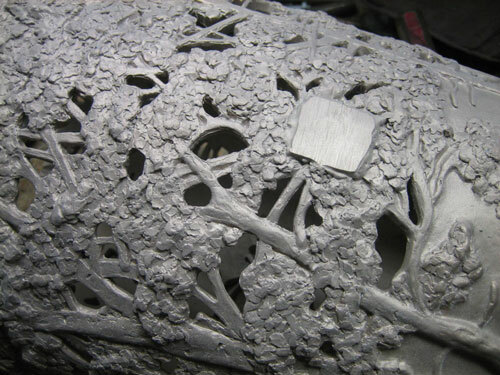 This is one fine example of the level of skill required by the talented artisans at Metal Arts Foundry, UT to insure a beautiful, museum quality casting. Voice of Wisdom was privately commissioned. 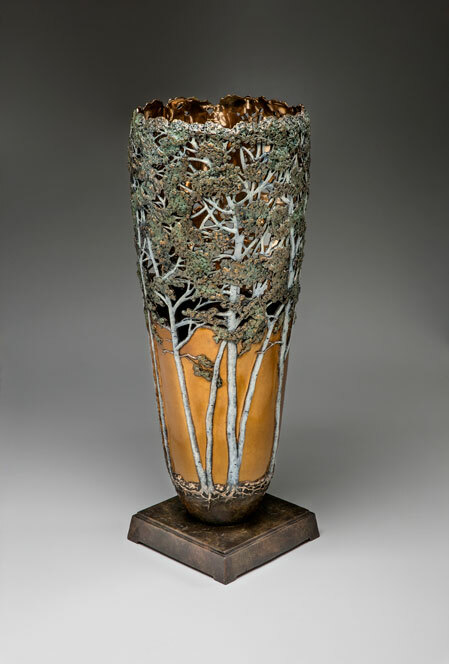 In response to my client's request for a piece that spoke to the qualities of a warm, strong and loving family, we easily agreed upon the rich and welcome inspiration of the aspen tree. Voice of Wisdom celebrates the beautiful and wondrous analogy of the aspen tree to a strong and loving family unit enriched by its history. Individual aspen trees may live as long as 100 years, but living as clones and creating one organism within a grove, they are indeed thousands of years old. The grove's roots are interconnected as they simply and consistently reach upward (or toward the Light). The same may well be true of our families if we trace our roots (genealogy) and recognize our deep, ancient and infinite connectivity. While sculpting the root system on the vessel into a delicate tapestry of intertwined life support growing only upward toward the Light, I focused on the hope that we will grow in our full awareness of our one larger, united family. At the same time, I held the intention that each of us, within our larger family, be reminded to hold the simple daily focus of reaching upward toward the Light. Aspens grow as fast as possible without any regard to their highly visible wounds. This led me to reflect upon how we carry our supposed family 'wounds' – our stories- and how much attention or limitation we attribute to what we name 'wound'. Aspen models a way of growing with, and perhaps from, these very wounds in deep and wondrous abundance. Allowed by its unique, flat leaf/stem structure, the leaves are able to flutter with the very slightest breeze. In high winds, the leaves clump together, reducing air drag (which can easily break trunks), helping them survive violent storms despite their delicate structure. I effortlessly felt the rich truth in this survival tool. In catastrophes and challenges, we find ourselves best armored with friends and family, and with their hands tenderly interlocked in ours. In retrospect, we recognize the gift of oneness and unity in a way words defy. Again, I personally reflected on the times many hands, clasped together, kept dear ones and myself breathing and moving forward in the most challenging of times. This same flexible leaf structure gives voice to aspen's familiar 'quaking' as it enables them to bend and twist with the gentlest breeze, resulting in a sweet, quaking lullaby. From our flexibility grows sweet music – sweet music we create together. A common clone is called "Pando" which means "I spread". What is it we might ask, that we each spread (offer) to and through our individual families? And, what is it we might subsequently spread to our larger single family? Aspen is a marvelous, wise, rich and soulful inspiration. Her way of living and growing is a beautiful, loving blueprint of utter generosity, tenacity, cooperation, community, leadership and strength – a blueprint lived out fully in many families and my deep hope for all families. She is a beautiful model of a divinely loving family – a profound Voice of Wisdom. The nine aspen trees on the vessel, a number symbolic of completion, suggest we are learning this integration of wisdom in our individual families, and bringing it to true fruition. When adding the numbers one through nine, the result is 45 – hence the edition size of 45.